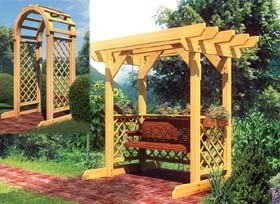 Add a beautiful garden structure such as a trellis, an arbor, or a wooden pergola to your back yard. These Garden structures come in a variety of designs and create warm welcome areas for shaded seating, attractive flowering bearing vines, and afternoon luncheons. These DIY project plans come with all of the details to create your own garden paradise.